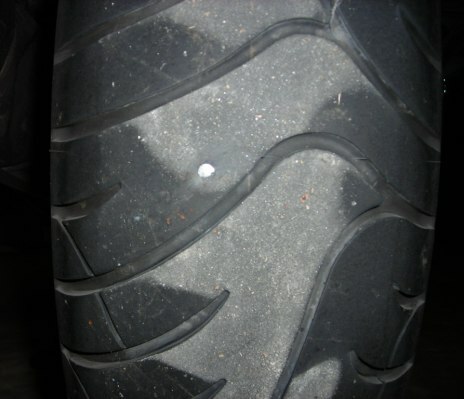 This morning I had decided to go ahead and take the back wheel off the motorcycle, remove the nail, plug the puncture and see how it went. I’ve done this before. The back wheel is pretty easy to remove off the big K-bike, just having to put it on the centerstand, remove the license plate holder and then remove 5 lug bolts. Yes, lug bolts and not lug nuts. You know, come to think of it now that BMW has made a K1300 and now makes a K1600 I guess the K1200 would actually be the little K-bike! Well went I went to remove the nail it seemed to start to disintegrate! It was then that I found that it wasn’t a nail but last fall’s repair of a nail that was actually leaking. I even confirmed the location with a photo of the nail right here on this blog! That’s right, the plug had developed a leak. I have no desire to repair a repair to a tire so it really does look like my rear tire purchase has been moved to sooner rather than later. The other night the bike just didn’t “feel right” in turns and I got that sneaky suspicion of a low tire. I let the tires cool and the next day checked the pressure. The rear tire only had 21 psi instead of its normal 42 psi. Last night I topped it off to 42 psi and now just checked it and it was 29 psi. I happened to notice a spike or a nail in the tire that missed when checking yesterday. I’ve already plugged this tire once and I’m thinking it’d be to risky and pushing my luck to plug it a second time. The Plug Seems To Be Holding! Well the tire plug seems to be holding air! After the repair I filled the tire up and for a short ride to warm the tire. Later that evening after it was well cooled, the pressure was 40.5 psi. I’ve figured that on average, checking the air pressure with the tire pressure gauge I have loses 0.5 psi per check. After 4 more daily checks now the pressure is now only down to 39.0 psi, right in line with the average of 0.5 psi per check. The real test will come this Sunday when we ride down to High Falls State Park. We were going to to ride to Cloudland Canyon today up in NW Georgia. In spite of it being cold in the morning, we were prepared. We were going to start out late in the morning after it began to warm up and we were going to have the liners in our jackets and be wearing good riding pants. With modern day fabrics, you can be warm and comfortable without looking like the “Michelin Man”. A problem arose during the pre-ride inspection. The back tire had only 18.5 pounds of air pressure. A quick turn of the wheel revealed the culprit. A nail! It was better to find it now then out on the road somewhere. Now BMW Motorrad was thoughtful enough to have included a nice flat repair kit with the motorcycle. But I decided to keep that for emergency use if ever needed on the road. So it was off to the auto parts for a “Slime” tubeless tire flat repair kit. I really wanted the one with just the plugs and glue as the BMW kit already had the tool. Well as luck would have it, they were out and I had to get the one with the tool and reamer! Still it was less than $10.00. I had forgotten that plugging a tubeless motorcycle tires is not one of the easiest things in the world to do, especially the insertion of the plug. Add to that the fact that the tire is also a reinforced tire because of the motorcycle’s weight! I damn near pushed to bike off the center stand! Note to self: Next time put the bike on the side stand and leave it in gear. It’s been plugged and a test ride taken. The soapy water reveals no leaking air at this time. I’ll monitor the air pressure the next few days to make sure the plug worked. Maybe we’ll get to ride next weekend?